y. In 2004, BMW introduced the new K1200S Sports Bike which marked a departure for BMW. It features an engine producing 167 hp (125 kW), derived from the company's work with the Williams F1 team, and is lighter than previous K models. Innovations include electronically adjustable front and rear suspension, and a Hossack-type front fork that BMW calls Duolever. BMW introduced anti-lock brakes on production motorcycles starting in the late 1980s. The generation of anti-lock brakes available on the 2006 and later BMW motorcycles pave the way for the introduction of electronic stability control, or anti-skid technology later in the 2007 model year. BMW has been an innovator in motorcycle suspension design, taking up telescopic front suspension long before most other manufacturers. Then they switched to an Earles fork, front suspension by swinging fork (1955 to 1969). Most modern BMWs are truly rear swingarm, single sided at the back (compare with the regular swinging fork usually, and wrongly, called swinging arm). Some BMWs started using yet another trademark front suspension design, the Telelever, in the early 1990s. Like the Earles fork, the Telelever significantly reduces dive under braking. 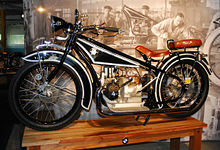 In July 2007, the Italian-made Husqvarna Motorcycles was purchased by BMW for a reported €93 million. BMW Motorrad plans to continue operating Husqvarna Motorcycles as a separate enterprise. All development, sales and production activities, as well as the current workforce, have remained in place at its present location at Varese. Husqvarna manufactures motocross, enduro and supermoto motorcycles.